Kayaker Admits To Setting Up A Rival Who Was Banned For Doping : The Torch In addition to spiking a fellow Japanese racer's drink, Yasuhiro Suzuki, 32, was found to have repeatedly resorted to trickery at competitions, such as stealing other kayakers' tools. Yasuhiro Suzuki of Japan reacts after competing in the Canoe Sprint Men's Kayak Single 1000m during the Guangzhou Asian Games on Nov. 25, 2010, in Guangzhou, China. Suzuki is now banned for eight years for spiking a fellow Japanese racer's drink with an anabolic steroid. 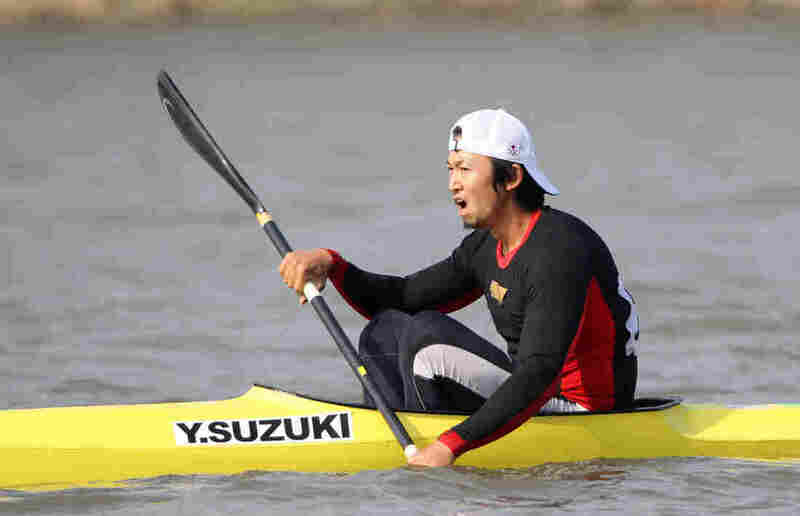 Japanese kayaker Yasuhiro Suzuki says his desperation to compete in the 2020 Tokyo Olympics led him to lace a fellow countryman's drink with an anabolic steroid — and now he's been banned for eight years. Before Suzuki admitted the plot, his rival Seiji Komatsu had been banned. Komatsu's ban was overturned on Tuesday, after the Japan Anti-Doping Agency found that Suzuki had laced Komatsu's water bottle with a banned substance at the 2017 Canoe Sprint Japan Championships last fall. Komatsu failed a doping test at the event, part of the Olympics qualifying process. The Japan Canoe Federation, which oversees kayaking, called the case unprecedented as it announced the results of JADA's inquiry on Tuesday. The canoeing federation says that in addition to spiking Komatsu's drink, Suzuki, 32, was found to have repeatedly resorted to trickery at competitions, such as stealing other kayak racers' tools or gear. Suzuki confessed to officials after he felt guilty about Komatsu's ban, Japanese media report. "We apologize for causing trouble, not only to canoe athletes but also to those of all other sports," JCF Director Osahiro Haruzono said, according to The Asahi Shimbun. Suzuki's doping set-up came after he and Komatsu had competed together as part of Japan's delegation to the 2017 World Championships in the Czech Republic. Both athletes had been seen as strong contenders for Japan's Olympic team. To prevent a similar scheme from playing out, the canoeing federation said it will designate a spot to store athletes' drinks at competitions. The canoeing body also said it will invite lecturers to create a speaking program based around the ideas of justice in sports and the spirit of fair play in competitions.